We train athletes and those who want to train, perform, and look athletic. While we primarily train athletes to improve sport performance, we also bring those same strength & conditioning principles to the general population to help them be the best version of themselves. Look good, feel good, play good. What most fail to realize is that body composition has more to do with how you’re eating than how you train. So when a female who “doesn’t want to lift weights because they don’t want to get bulky” walks into G-Strength, they are reminded of 2 things: 1) Bulky is a result of poor dietary choices, not heavy weights. 2) In order to achieve that “toned” look, their muscles must grow because you can’t chisel something that isn’t there. And what’s the best way to accomplish this? You guessed it: increasing STRENGTH. Muscles are built at G-Strength and revealed in the kitchen. Whether you are an athlete training to perform at the highest level or a weekend warrior looking to get rid of some back pain, you will find a 2nd home at G-Strength. Giancarlo graduated with a Bachelor of Science in Clinical Exercise Science from Ithaca College in 2016. In August of that same year, he started his own business: G-Strength. After countless “all-nighters” driving for Lyft, he eventually built up his clientele and saved up enough money to buy equipment and pay the bills. What began as Giancarlo training clients in (what was intended to be) the bedroom of his apartment, has now grown into the semi-private strength and conditioning gym you see today. Giancarlo’s pursuit of strength and conditioning began in high school, when he had the opportunity to work alongside the newly hired Strength & Conditioning Coach at the William Penn Charter School, Jeff Diritto. It was after this experience, that he knew this is what he wanted to do this rest of his life. 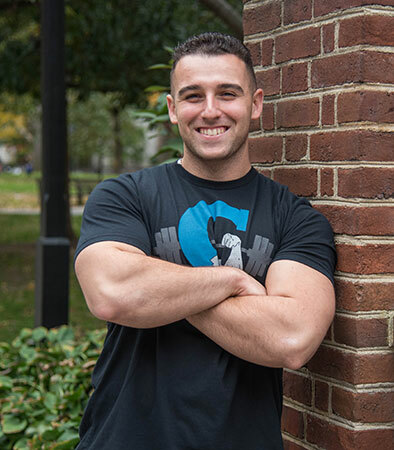 Throughout college, he interned at Cornell University and worked at a strength and conditioning gym.